This pomegranate cosmopolitan recipe is perfect! It’s nicely balanced, beautiful, as well as delicious which makes it a great cocktail to serve at your next party! Oh my word, this perfectly delicious pomegranate Cosmopolitan is a work of art! It is both beautiful and delicious! Look at the color. It is so much a deeper red than the classic Cosmo and has a subtly different taste. I dare say, it is even more delicious than the classic one! I remember the first time I ordered a Cosmo. I have to admit I really didn’t think I was going to like it. I had been hearing about them for a while but I considered Cosmos a fru-fru drink and I was not a fru-fru drink kind of gal. Even though I worked at a Mexican restaurant that offered no less than 10 different fruit-flavored margaritas, in addition to drinks like piña coladas and daiquiris, my cocktail of choice was usually the classic margarita. Plain. And give it to me on the rocks, not served up like a gas station slushy. I snubbed fruity drinks. Ah, youth! So, I looked at that classic Cosmo and thought, “Pink!? Since when do you drink a pink cocktail?” I still ordered it because a friend told me I’d like it. Peer pressure! But in this case, I’m glad I ventured into the land of ‘fru-fru’! That marks the time in my life when I began to consider imbibing different kinds of cocktails. That first Cosmo opened my eyes and, of course, one’s tastes change over the years. I mean, my favorite cocktail today is the martini for heavens sake and as I’ve stated before, if you had asked me years ago whether I’d ever drink a martini, I’d have laughed my head off. We have some vodka, pomegranate juice, triple sec and lime juice. I grab my shaker and fill it halfway with ice. First up is 2 ounces of vodka. I use Grey Goose since it’s my favorite at the moment. Now it’s time to pour out the triple sec. Any orange flavored liquor would work. I’m all for good quality liquor and would have used Cointreau if I’d had any in my liquor cabinet. Alas, I didn’t. Not that triple sec isn’t fine. It is. I just think Cointreau is smoother. I measure out 0.5 ounces and into the shaker it goes. Next, I cut the lime in half and squeeze one half into a measuring cup. I have found that half of a small lime yields 0.5 ounces but the lime I used measured closer to 1 ounce and I don’t like that much lime in my Cosmos so I poured some out. Fool around with the amount of lime to see how you like it. But I think 1/2 an ounce is a good bet. I always use freshly squeezed lime juice, not the bottled kind. I pour it into the shaker to join the vodka and triple sec. I measure out 1 ounce and add it to the shaker. Doesn’t that look great? As you can see in the photo above, the recipe on the side of my shaker differs; it wants you to use more triple sec. I’ve tried it with more but I have to say, I prefer less. There are many different ways to make a Cosmo. I really like my way! I grab a martini glass, cap the shaker and shake it for 30 seconds. Shaking it causes the ice to break up and when you pour it in the martini glass, it floats on top of the drink and keeps it cold longer. I slice a thin wheel of lime, cut a little slit in it, twist the lime and place it in the cocktail for garnish! 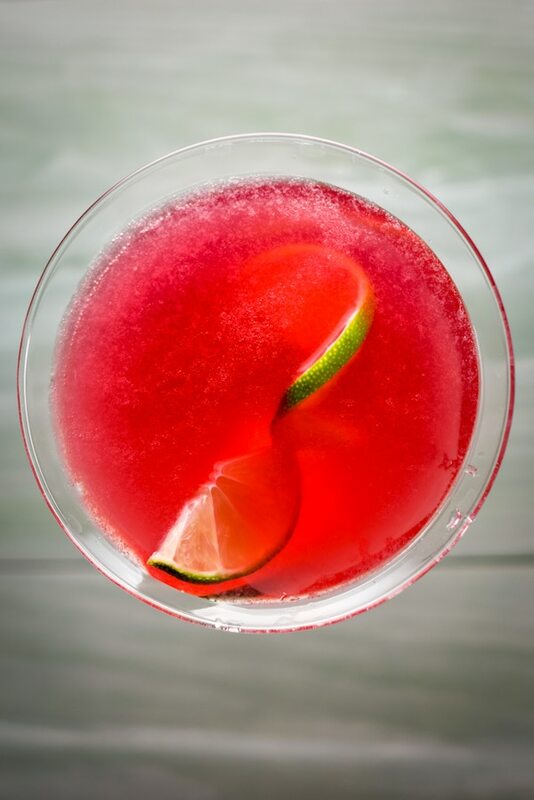 Here’s an aerial view of the perfectly delicious pomegranate Cosmopolitan! All that is left is to pick up the glass, snuggle onto the couch with my honey and sip away! I hope you enjoyed this recipe. Leave me a comment to tell me what you think. And if you make this recipe, please leave a comment and rate the recipe! This delish drink is so colorful and tasty! Serve it at your next party!